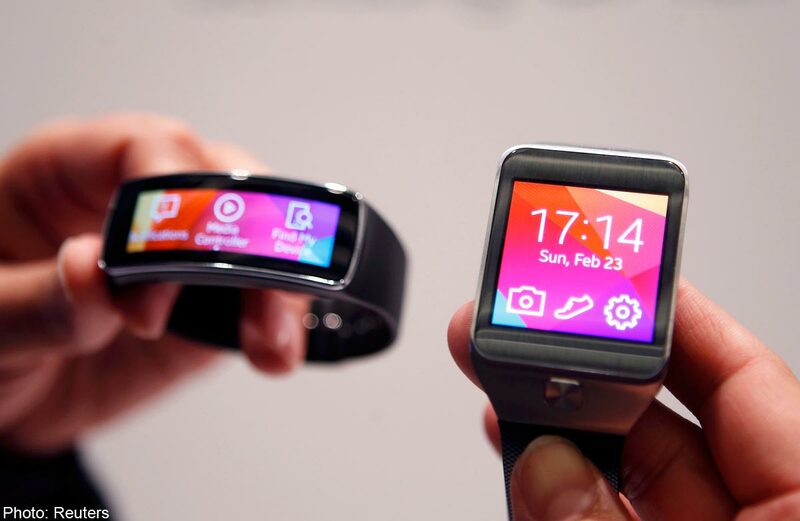 The Samsung Gear Fit, Galaxy S5 smartphone, and Gear 2. 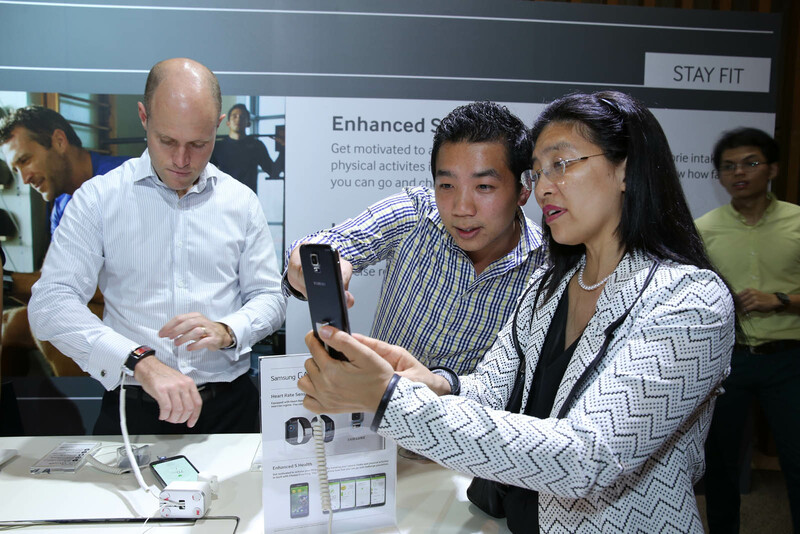 SINGAPORE - Samsung yesterday announced the launch of its latest flagship model and its latest wearable devices - the Gear 2, Gear 2 Neo and Gear Fit - in Singapore. 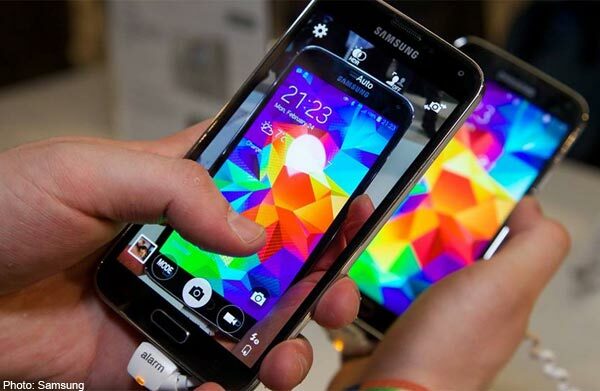 The Galaxy S5 LTE features an advanced camera, fast network connectivity, enhanced device protection as well as fitness tools, said Samsung. 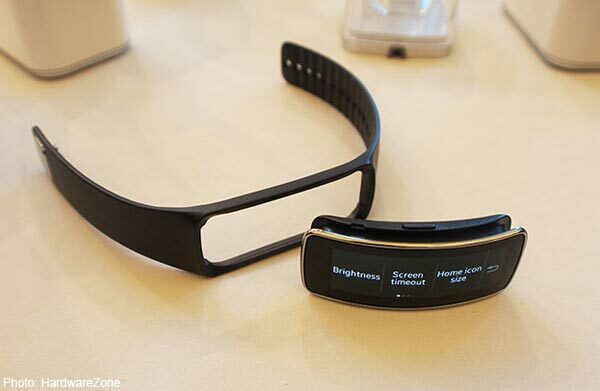 This makes it compatible with the Gear 2 and Gear Fit, which are geared toward fitness buffs. 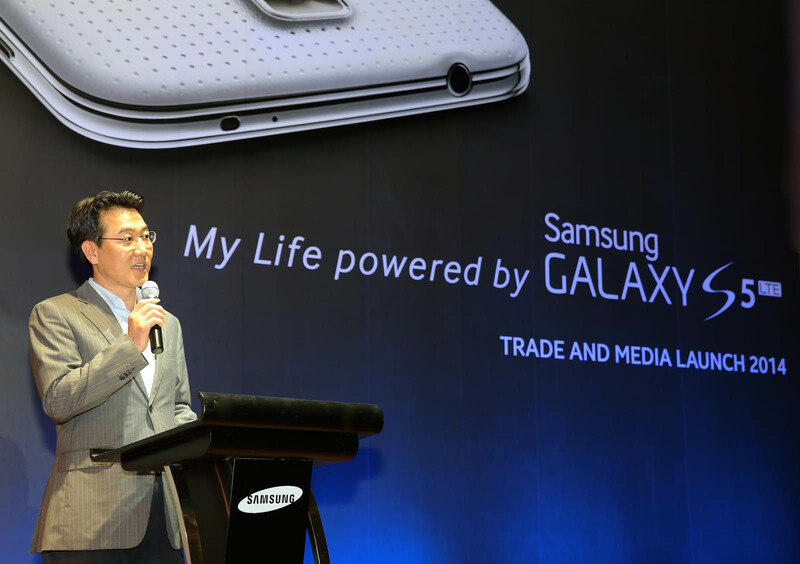 The new devices are designed to help consumers who want to lead active lifestyles "without sacrificing their personal style or their ability to stay connected on the go", said Ms Irene Ang, Vice President of Marketing at Samsung Asia Pte Ltd. The S5 has a built-in heart-rate sensor - a first for a smartphone - and a pedometer for measuring footsteps, as well as the S Health 3.0 app which can help users manage their exercise routines. 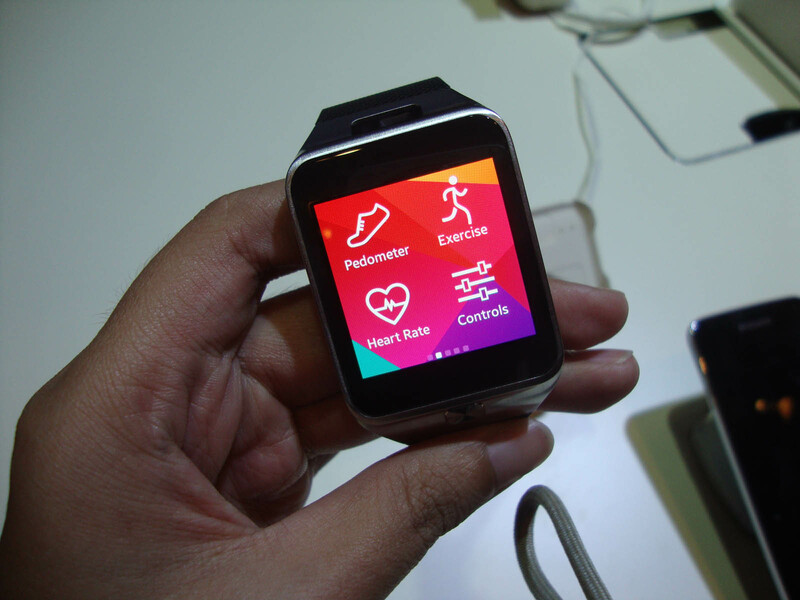 Users can sync their Gear Fit watches to the S Health app, and monitor their exercise records on their Samsung smartphones, said Samsung. 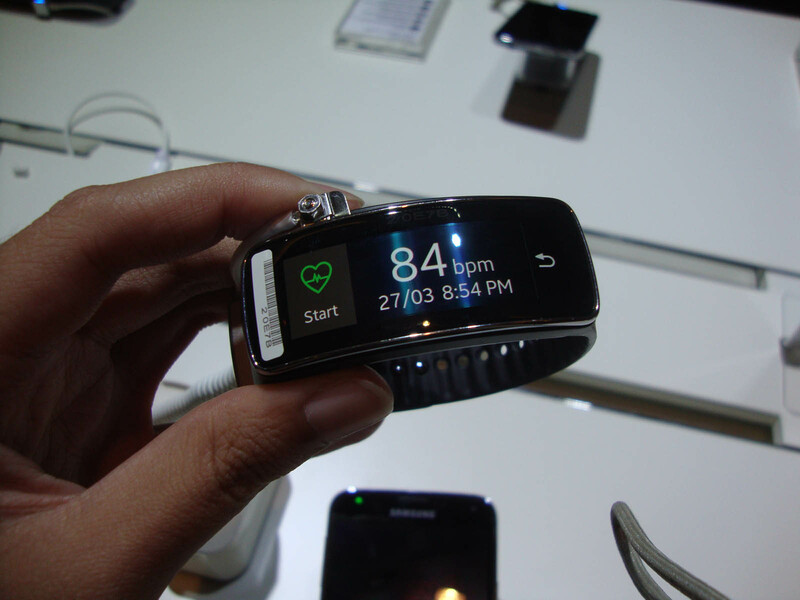 For instance, you can measure your heart rate on the Gear Fit's built-in heart-rate sensor, and the reading can be transferred to your Samsung smartphone. 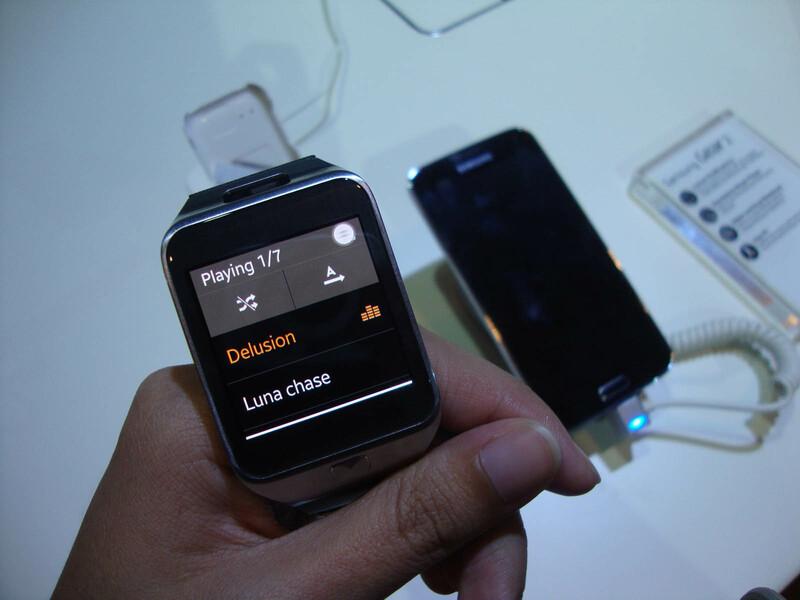 The Samsung Gear 2 and Gear 2 Neo are compatible via Bluetooth with a variety of Samsung Galaxy devices, including the Note 2, Note 3, S3, S4 and S4 Zoom, said Samsung. 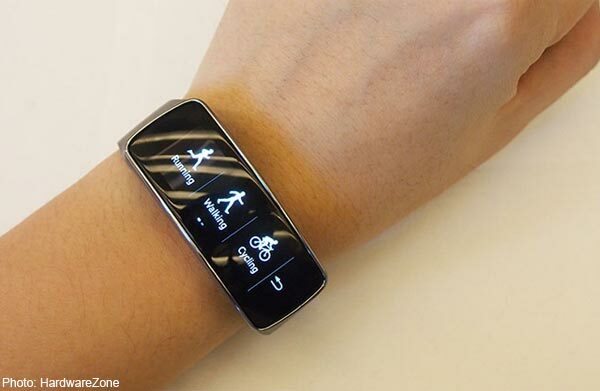 Once connected, users can receive incoming calls, text messages and e-mail notifications on the Gear 2 and Gear Fit. In addition, the S5 has qualified protection from water and dust (IP67), so you don't have to worry about dust or rain while you work out. 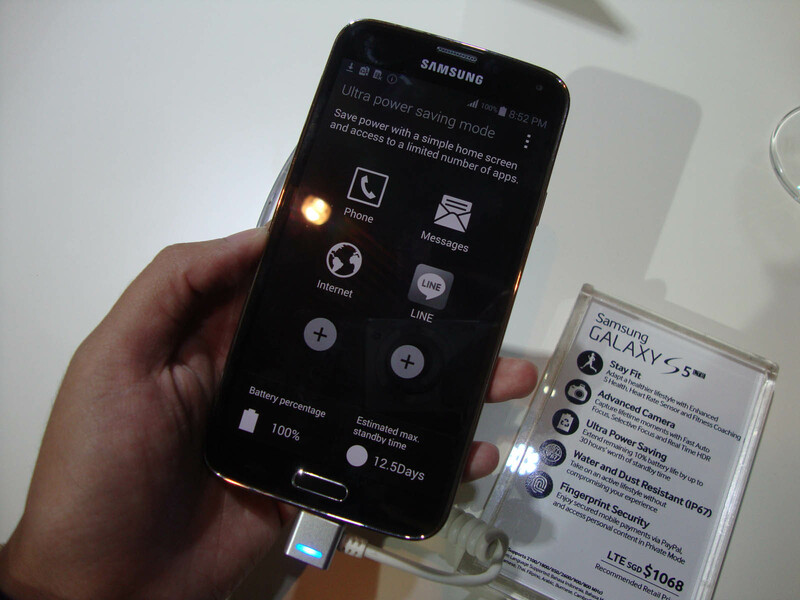 Also, by enabling the S5's ultra power saving mode, your remaining 10 per cent battery life can last up to 30 hours. When the feature is enabled, apps such as phone and SMSes will still be available, while all unnecessary features will be shut down to minimise battery consumption. 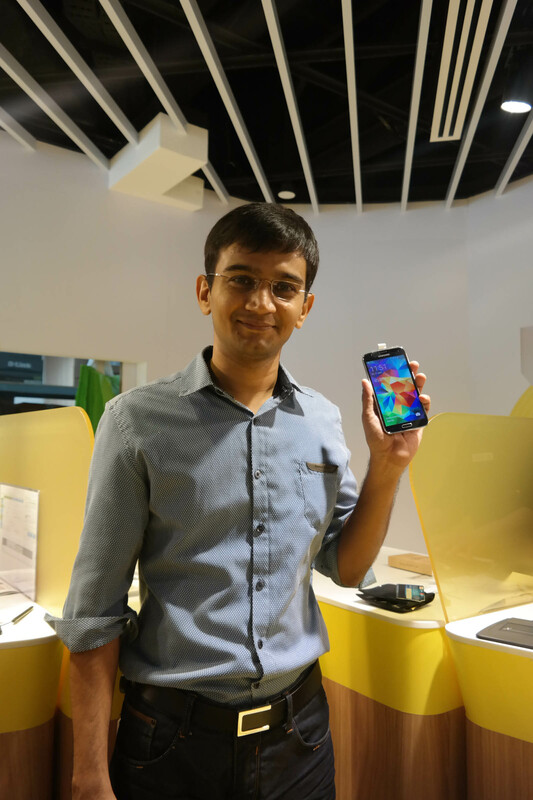 You can also visit Samsung Experience Stores to pre-order the S5 (without contract) by placing a $50 deposit per device. 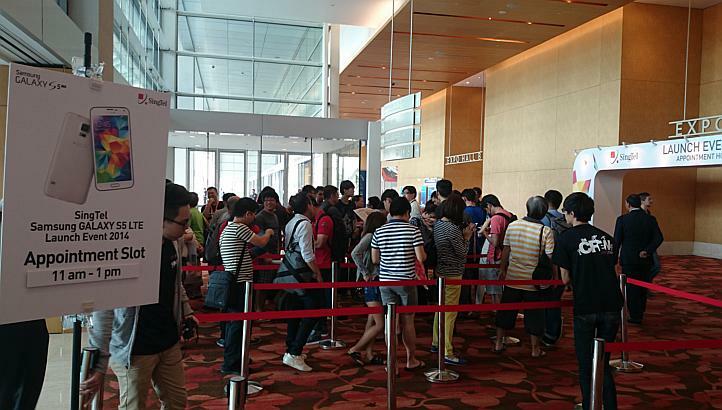 At the SingTel location at Marina Bay Sands, the first person in line started queuing at 6.45am. 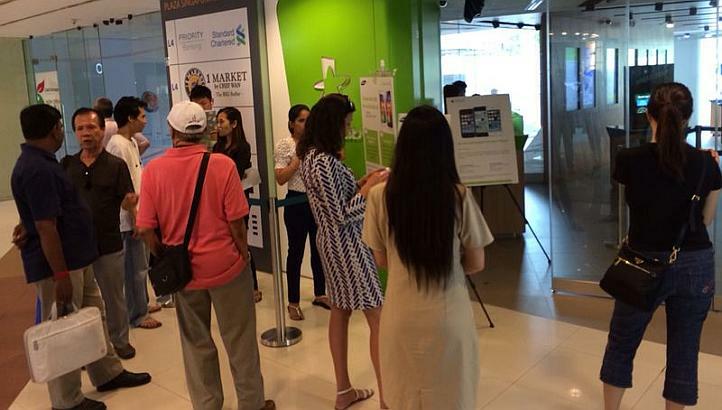 By 10.30am, over a hundred people were already in line. 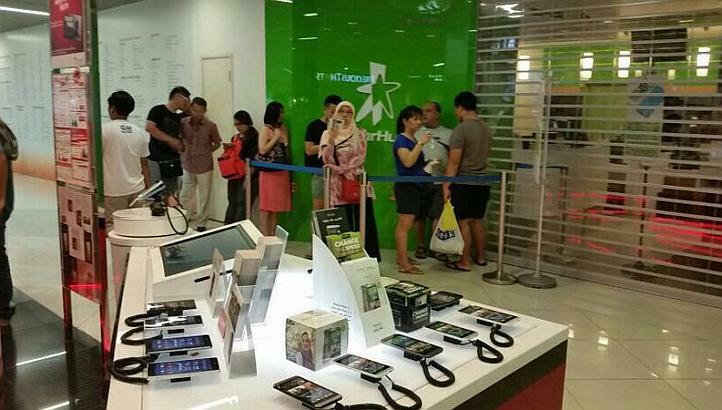 The queues at telcos and Samsung Experience Stores this morning were for customers who preordered the phone. 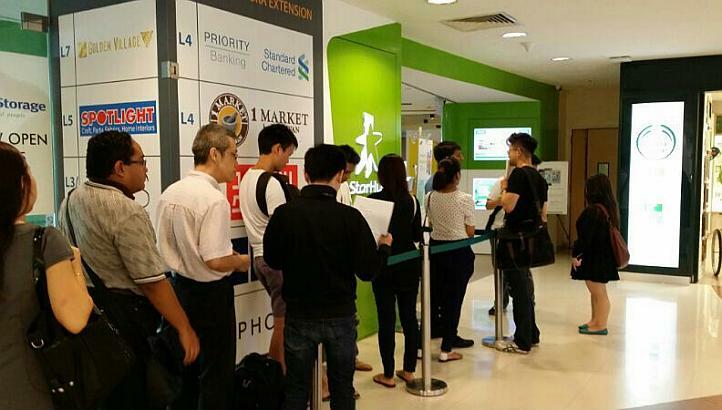 Instead of just having one location, StarHub had collection points at 14 StarHub stores and gave timeslots and pick-up locations to customers. 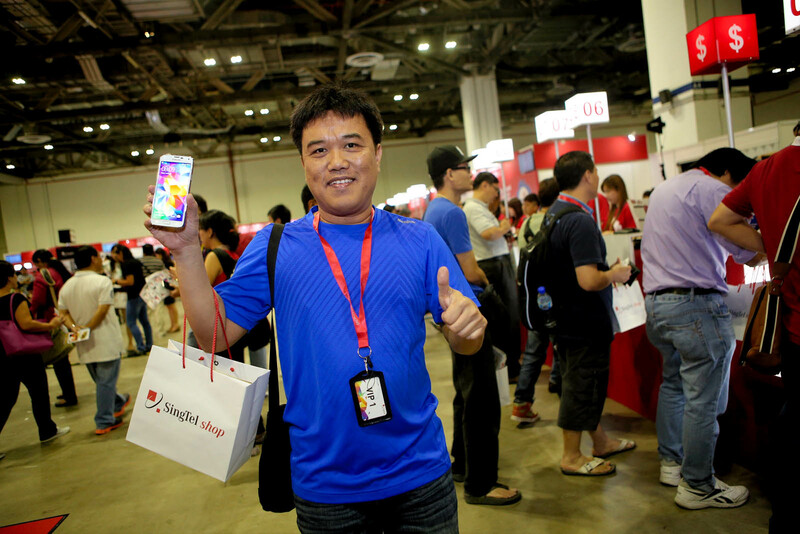 Those who preordered the phone received freebies, including a battery kit and HD TV adaptor. Announced in February at the Mobile World Congress trade show in Barcelona, all three devices come with a heart rate monitor. 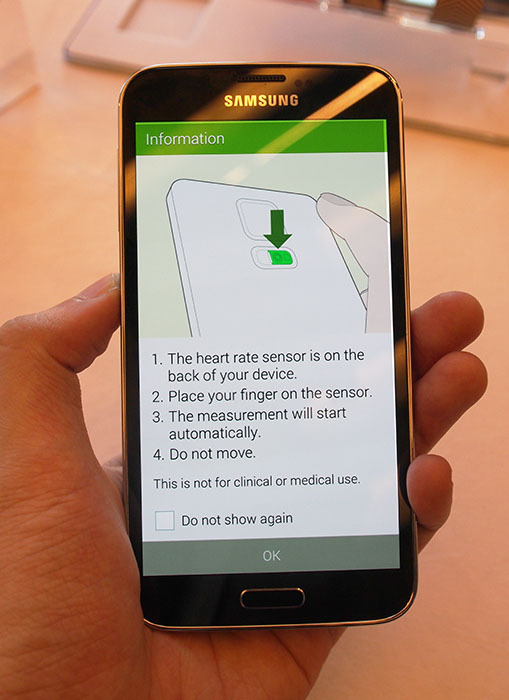 The Galaxy S5 has a faster camera and comes with a biometric sensor. 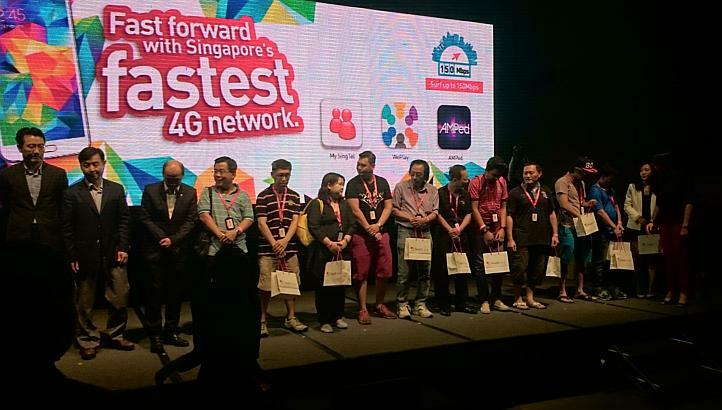 The first person in SingTel's Samsung Galaxy S5 queue, Mr Rozario Edgar Malbrea, 42, an IT professional. He was in the queue 5 hours before sales start at 11am. 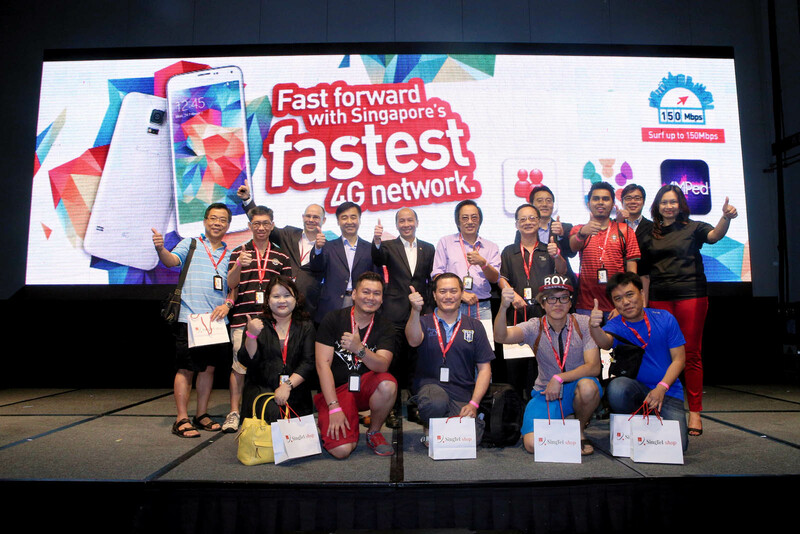 The first 10 customers in the queue onstage with SingTel and Samsung executives launch the Galaxy S5 smartphone in Singapore. 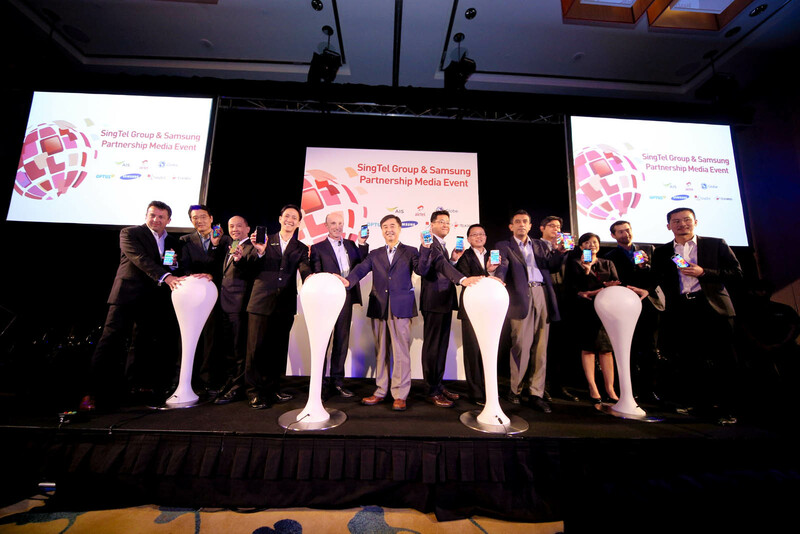 SingTel and Samsung executives launch a landmark regional partnership between the 2 companies to accelerate mobile data growth in emerging markets. 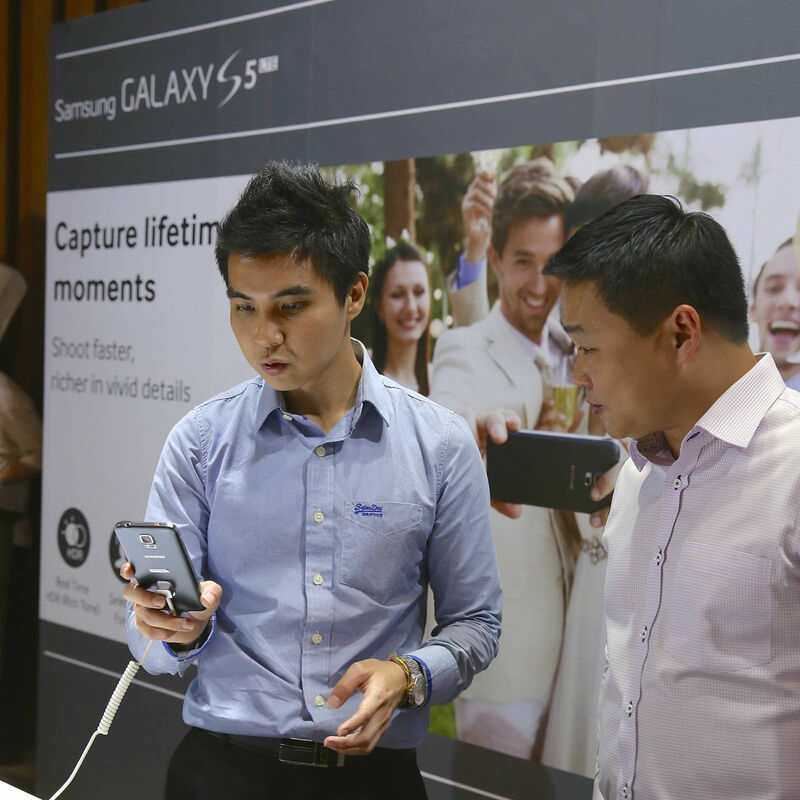 Samsung product manager Chua Khim Guan sharing key highlights of the Samsung GALAXY S5 LTE with guests at the Samsung GALAXY S5 LTE launch event in Singapore. 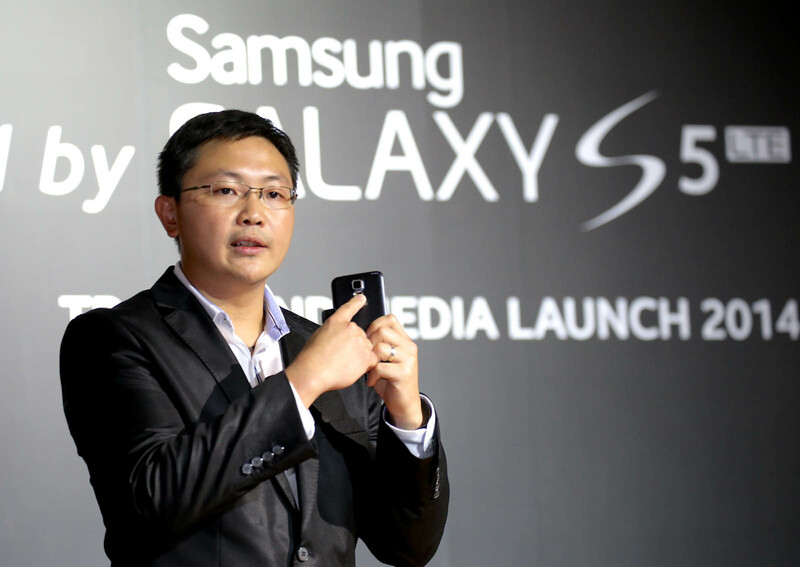 Mr Harry Lee, President, Samsung Singapore giving a welcome address at the Samsung GALAXY S5 LTE launch event. 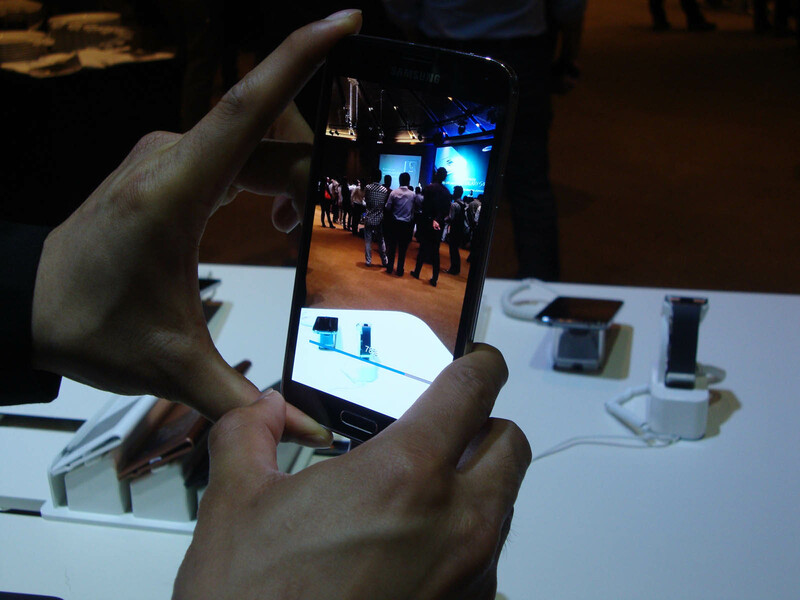 Guests experiencing how the Samsung Gear 2 syncs with the Samsung GALAXY S5 LTE for a personalised user experience. 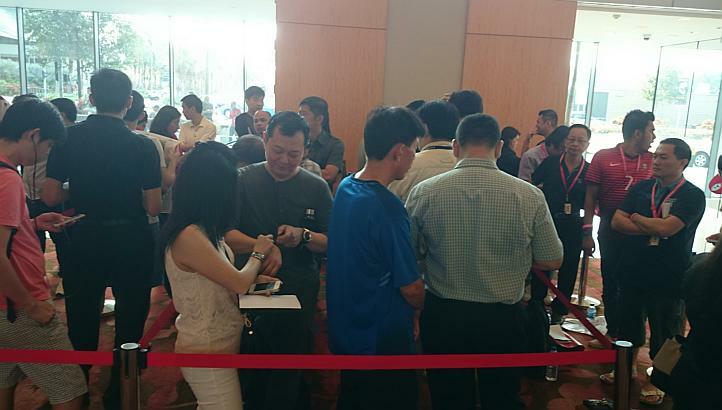 Guests trying out the Samsung GALAXY S5 LTE at the trade and media launch event in Singapore. 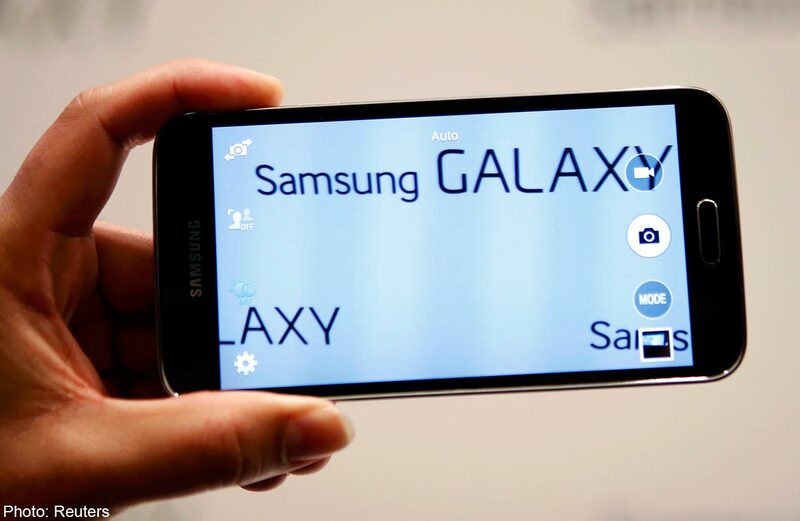 The Samsung Galaxy S5 LTE smartphone. 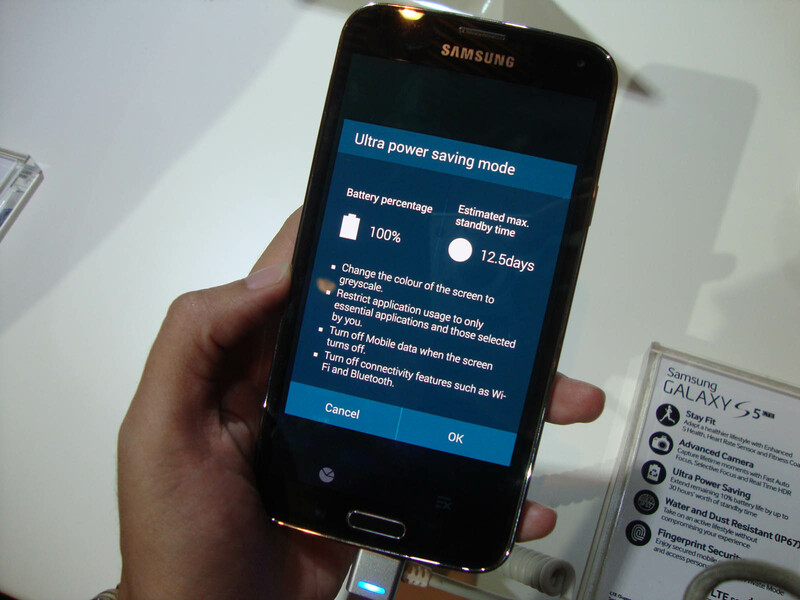 The enabled ultra power saving mode on the Samsung Galaxy S5 LTE smartphone. 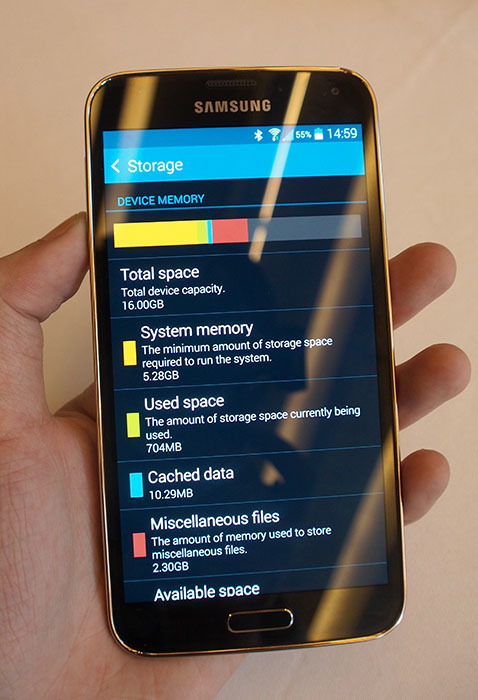 The prompt that appears when a user enables the ultra power saving mode on the Samsung Galaxy S5 LTE smartphone. 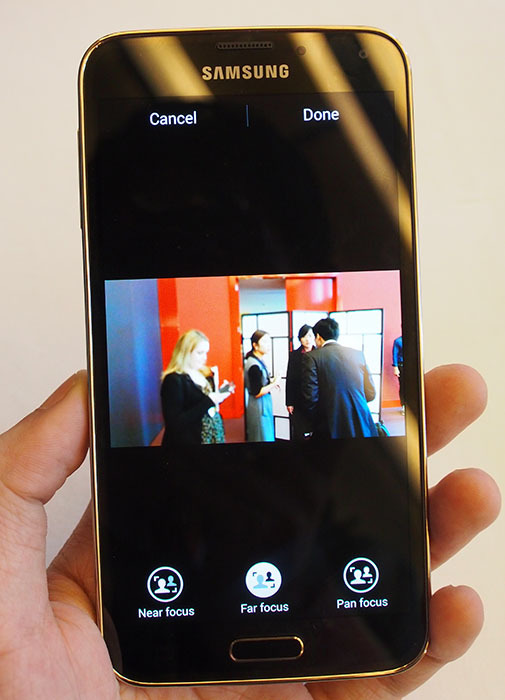 A guest demonstrating the use of the Samsung Galaxy S5 LTE camera at the launch event. 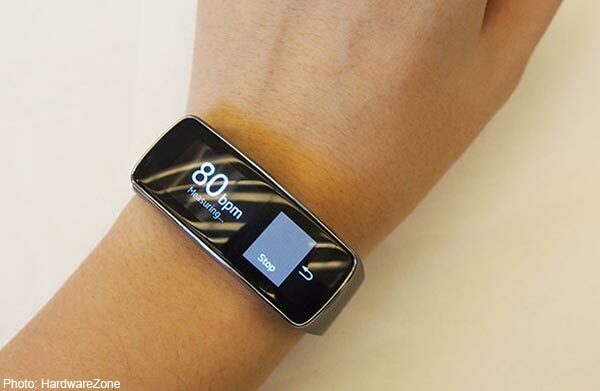 The Samsung Gear Fit smartwatch. 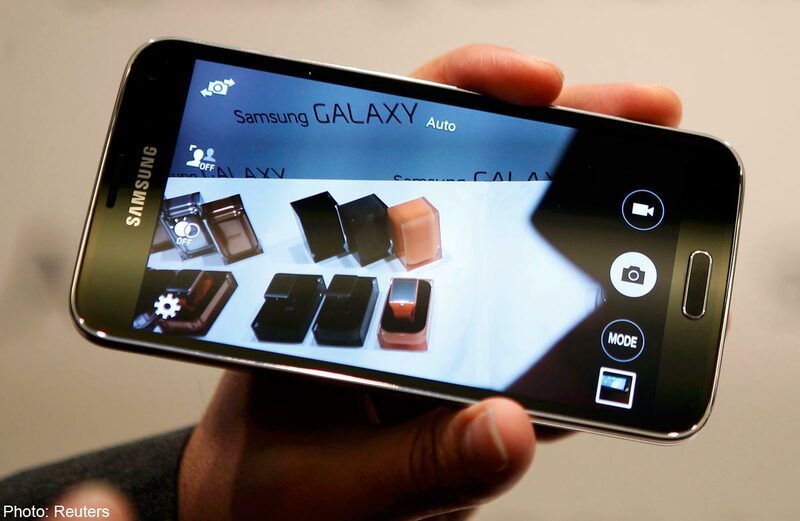 For the S5, Samsung has re-focused attention on functionality and features that people actually use. 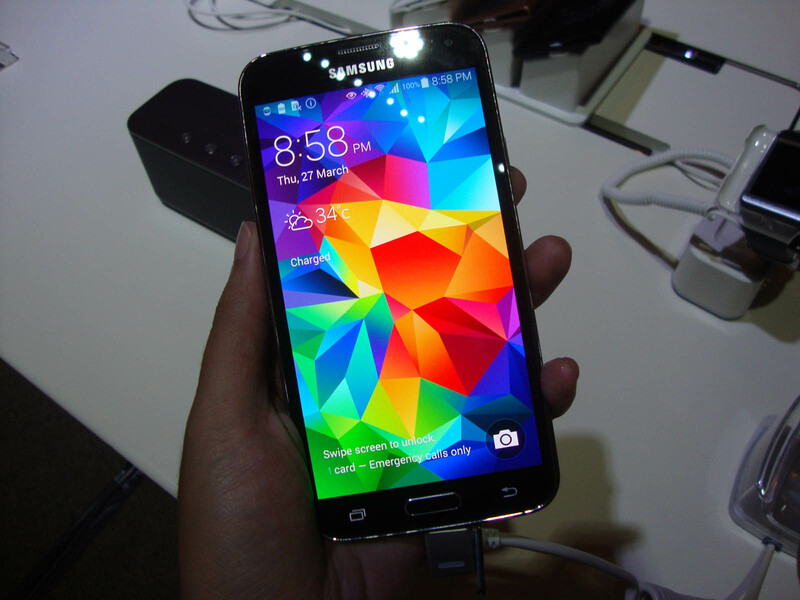 The Galaxy S5 will be available in 150 countries on 11th April. 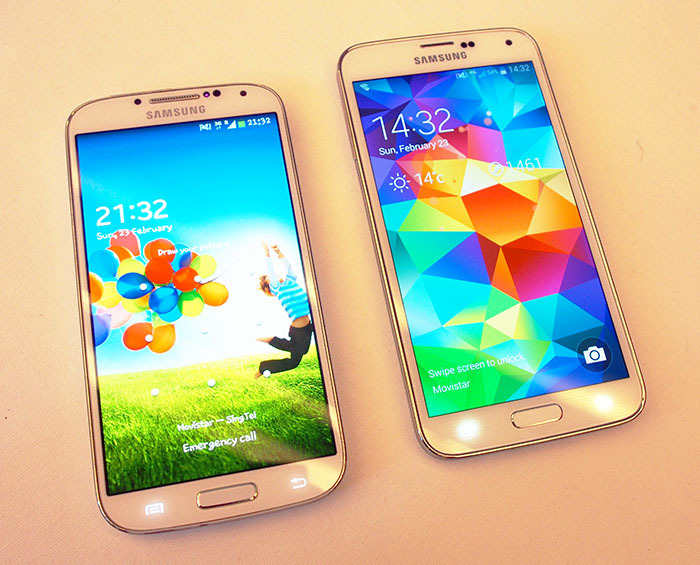 The Galaxy S5 (right), looks very similar to last year's Galaxy S4 (left). 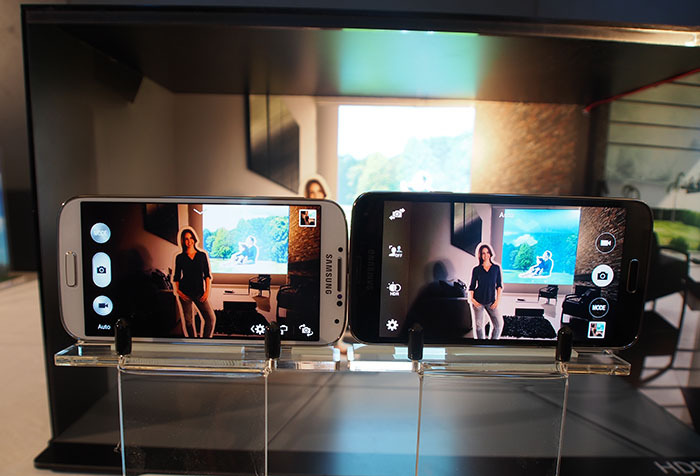 At 5.1-inches, the Galaxy S5 gains an inch on last year's model. 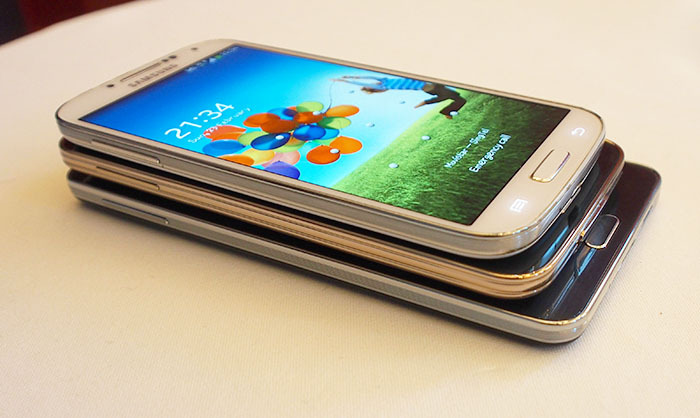 Galaxy Note 3 (bottom), Galaxy S5 (middle), and Galaxy S4 (top). 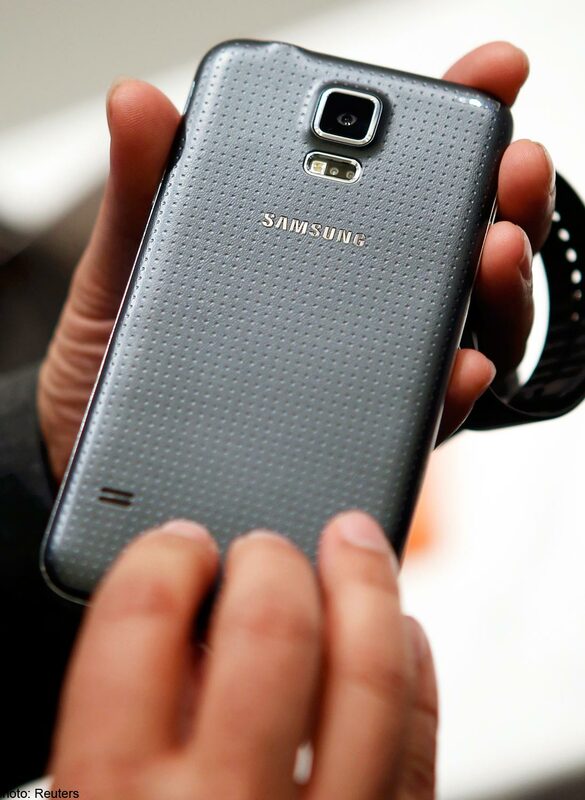 The back of the S5 is covered with dimpled micro dots, which provide an interesting textured surface. 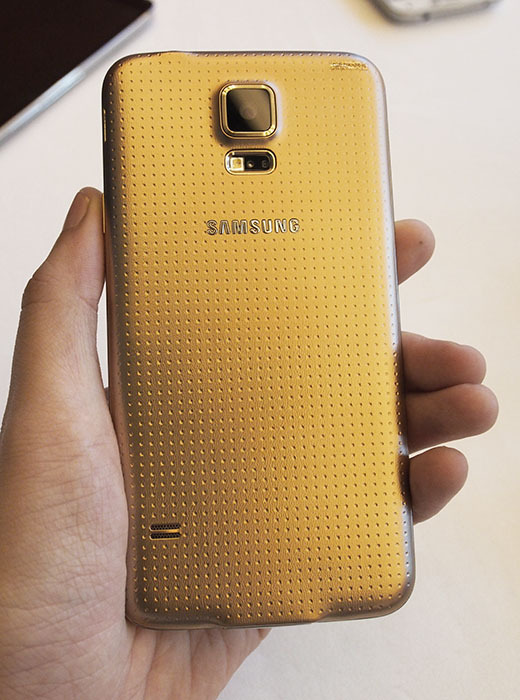 Like Apple, Samsung has opted for more of a copper-color gold. 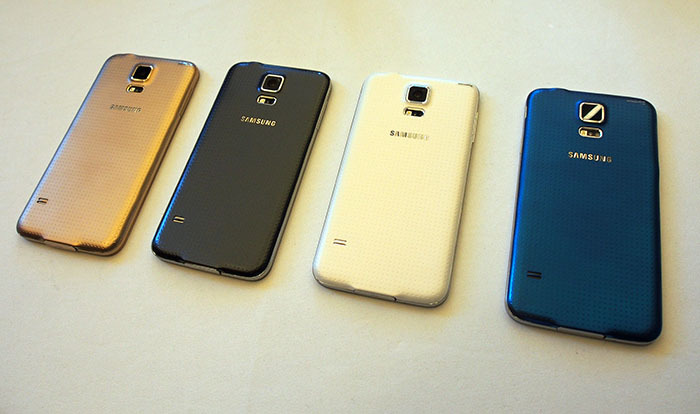 All four S5 launch colors. The OS and pre-installed apps take up quite a lot of storage space. This particular 16GB unit only has 8GB storage remaining. Real-time HDR mode (right) allows for more detailed shadows without blowing out highlights. For this photo, we've chosen the 'Far Focus' option, as you can see the lady on the left, nearer to the camera is now out of focus, and the lady in the middle, further away is in focus. You have to ensure you cover the entire IR blaster/receiver with your index finger to get the heart rate monitor to record properly. 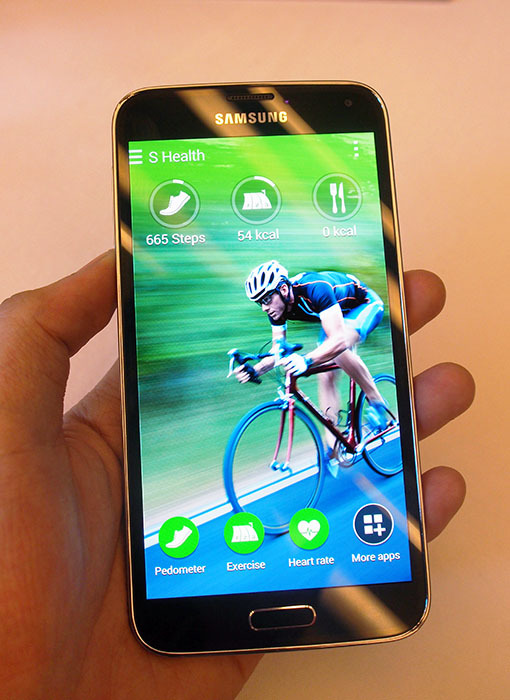 The S5 focuses on features people will actually use - like the S-Health 3.0 fitness app. Unlike Apple's 5S sensor, which just requires you to place your finger on the button, the S5 requires a downward swiping motion. 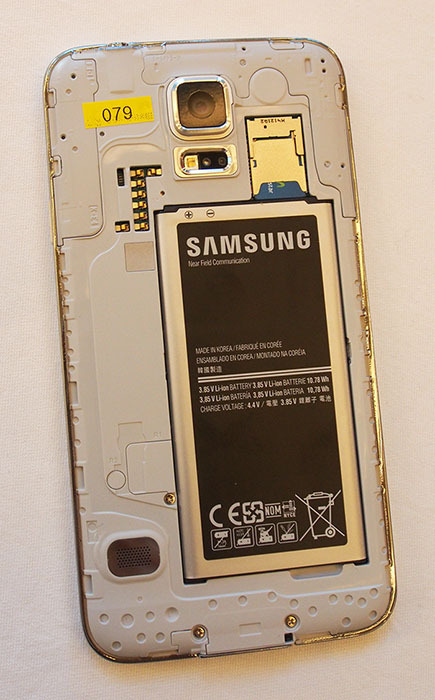 Thanks to its bigger size, the S5 also comes with a bigger battery. 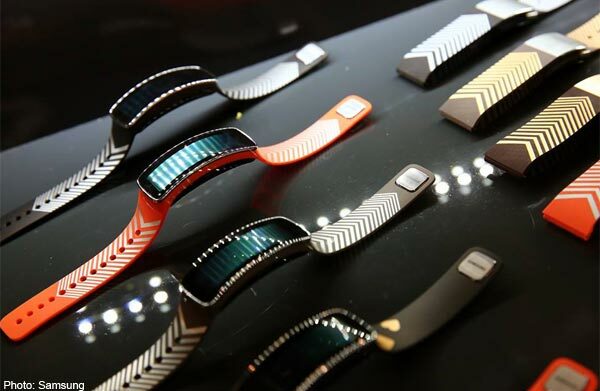 Samsung is focusing its efforts on wearable technology. Like the Gear 2 and Gear 2 Neo, you can configure and personalize the Gear Fit's wallpaper and clock display. A heart rate monitor lets you measure your pulse during exercise or when resting. Pre-installed fitness apps include workouts for walking, running and cycling. The module simply pops out of its strap, making it easy to clean or replace. 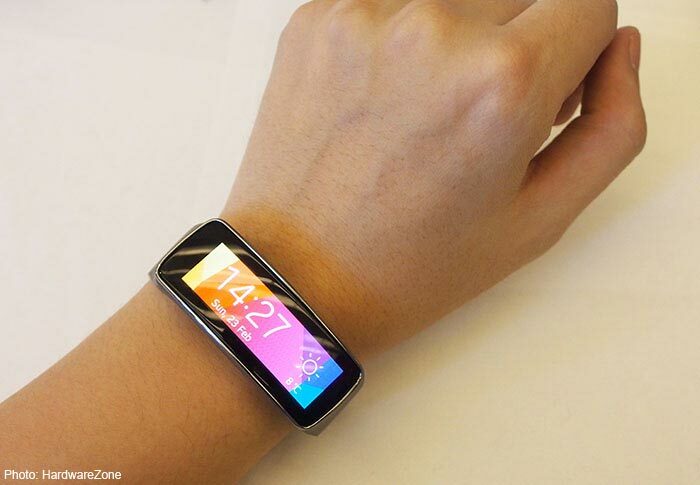 The curved display isn't flexible, but it should fit well on the wrists of majority of guys.